Robotic Cell Integrations - Warehouse and Distribution - Automatic Systems, Inc.
Robotic Cell Integrations are used to automate functions for a variety of purposes in manufacturing, warehousing and distribution. 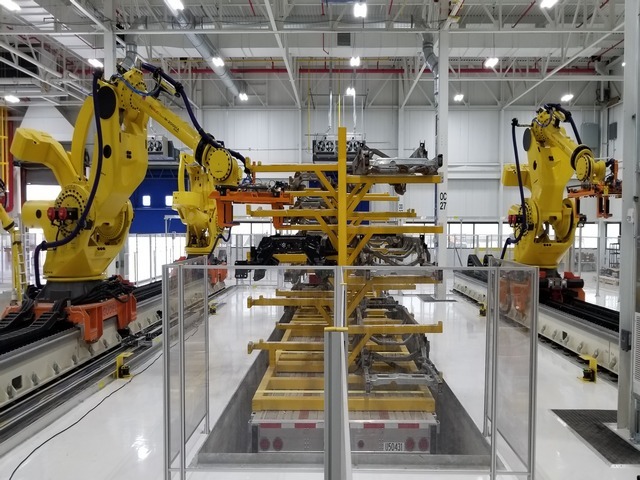 Typical robotic applications include packaging and labeling, palletizing, assembly, pick and place operations, welding, painting, product inspection, etc. There are a number of different robotic types that handle different operations (Delta Robots, Gantry Robots, SCARA, etc.). Robot arms can generally move in 2-3 axis, and the wrist can also move in 3 additional axis called yaw, pitch, and roll. Robots can handle payloads with weights ranging from less than a pound to thousands of pounds depending on it’s capacity and reach. 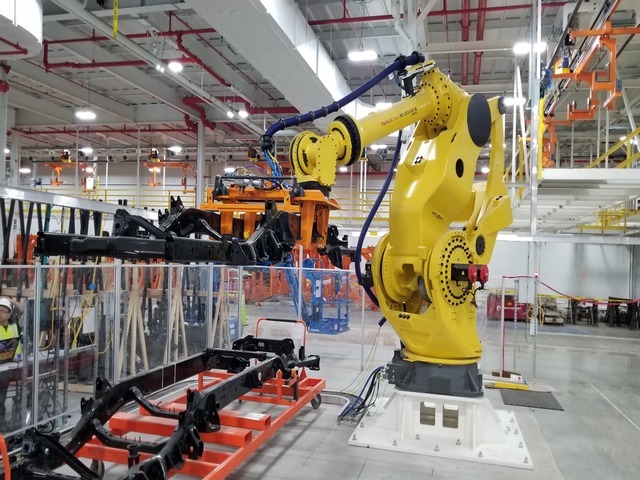 There are a number of different robot arm manufacturers in the world – Fanuc Robotics, ABB Robotics, KUKA Robotics, and Yaskawa being some of the largest. A robot cell is a robot arm working with a collection of ancillary machines or peripheral equipment. A typical cell might utilize conveyor feeding the cell with a robot arm palletizing to/from one or more conveyors with pallets. A robotic programmer or software engineer will program how the robot interacts with other devices in the cell relative to their positions in the cell and synchronizing all the peripherals with them. Programmers generally work offline to do the initial programming of a robot cell and once everything is mapped the processes are simulated. To save time and money designers use simulation software to create applications for a robot without depending on the physical operation of the arm and end effector. It is also much safer to program offline and then run simulations before uploading the program to the robot to catch any errors/safety issues before “going live.” Different robot arm providers have different programming/simulation software that provides a platform to teach, test, run, and debug programs written in a variety of programming languages. A teach pendant is a handheld control and programming unit that teaches the robot positions. The standard features of such units are the ability to manually send the robot to a desired position and “jog or inch” to adjust a position. Robots generally run at a slower speed when using a teach pendant for safety since the user is typically test-running through a new or modified routine and needs careful positioning. The essential robot arm peripheral is the end-of-arm-tool (EOAT). Some commonly used EOAT devices for material handling applications include picking up objects by vacuum or grippers and palletizing the items. There are many different examples in other industries such as welding devices (MIG-welding guns and spot-welders), spray guns for painting/coating and grippers (devices that can grasp an object, usually electro-mechanical or pneumatic). End effectors are can be very simple or highly complex and can be designed to do multiple actions in concert. They may use various sensors (including visions systems) to aid the robot in locating, handling, and positioning products. ASI is a FUNUC Authorized Integrator and we provide robotic solutions for warehousing, manufacturing and automotive applications.